Backup Green Bay Packers quarterback Matt Flynn isn’t expected to play Friday night when the Packers face the Arizona Cardinals in Phoenix. The Packers are going through their final practice of the week this morning and Flynn is only a spectator at this point. 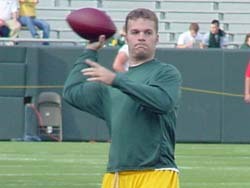 Flynn suffered a sprained right shoulder when he was hit while throwing in the Packers 31-21 preseason win over the Buffalo Bills at Lambeau Field.